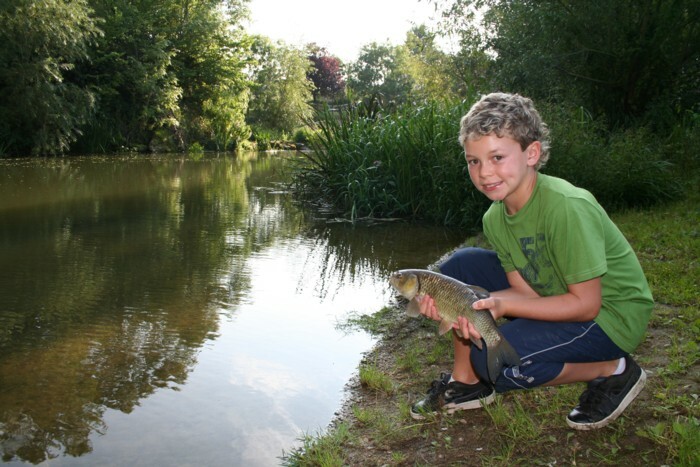 9 year old Tyler has been asking me to take him fishing during his summer holiday. Well with him and his family away on holiday and me chasing large barbel the weeks passed by. So it was the final day of his school holiday that was to be the day. I arranged to pick him up at 1pm and with the sun beating down and the temperatures in the high 20’s my thoughts were that it was going to difficult. We only had a 4 hr window of opportunity. I chose a stretch of river where we could get a couple of chub from off the top on floating crust. Then close by I knew of a stretch that contained a small shoal of barbel to almost double figures. We arrived to find a couple of anglers fishing the weirpool, however they had caught one small chub of about 1lb. The pool looked devoid of fish to be fair with a pitiful flow and a grayish stale colour. We headed to the end of the weir pool where the water shallowed over a gravel bed and under the overhead tree branches. The flow is normally quite pacey and the chub have little time to inspect the crust before it passes them by. Today though they would have time to look several times, take a couple of leap’s out of the river then decide whether to take the bait or not. We catapulted out some crust to see if any chub were at home. After about 10 minutes we established that there were about 4 fish taking the crust as it drifted down the run under the trees. The setup was easy a loafer float with a size 10 hook and 5lb line. Simple. Tyler fed crust to the chub using a catapult with a worryingly accuracy for a 9 year old. The plan was for him to spot the take and then for me to hook the fish, then hand him the rod to play it in. The splashes and swirls from the fish taking the bait had our hearts racing, well mine anyway. Well this prepared plan was soon put to action as the first chub took the bait. I struck and stopped the initial run from a spirited chub. I handed Tyler the rod and he fought the fishing keeping the rod tip high as he had been told. Soon we had it netted and he was admiring his first ever chub. 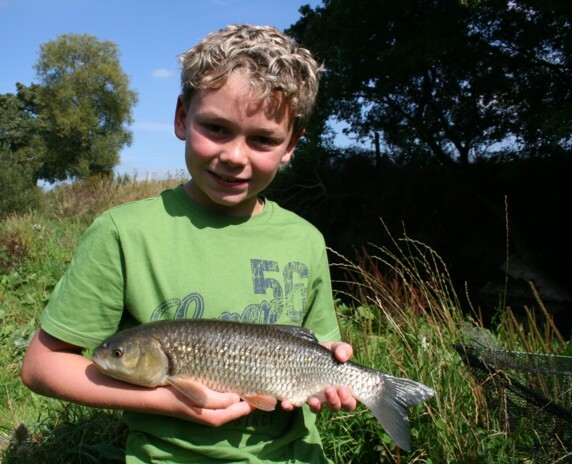 Tyler and his 2.5lb chub, what a start! We let the swim settle while we were taking photo’s. Also we returned the fish downstream away from the other chub in the swim. We held the chub in the net until it recovered then it swam away strongly. We returned to the swim and Tyler continued to feed the crust into the river and spotted a few more chub taking the bait, with their splashes and swirls. The branches of the trees created a good deal of shade for the chub in the water, and they fed quite comfortably and confidently. Soon the process of casting out and watching the bait travel downstream was in motion. It’s important not to let the line drag the crust otherwise the chub will inspect the bait but not take it. Towards the end of the run there was a large splash and the crust disappeared with the float being towed under. Again I struck and had the fish on and then handed the rod over. Tyler kept the fish on a tight line, with the clutch on the reel giving line on a couple of occasions. He did say they don’t half pull don’t they. So this was a much better chub. 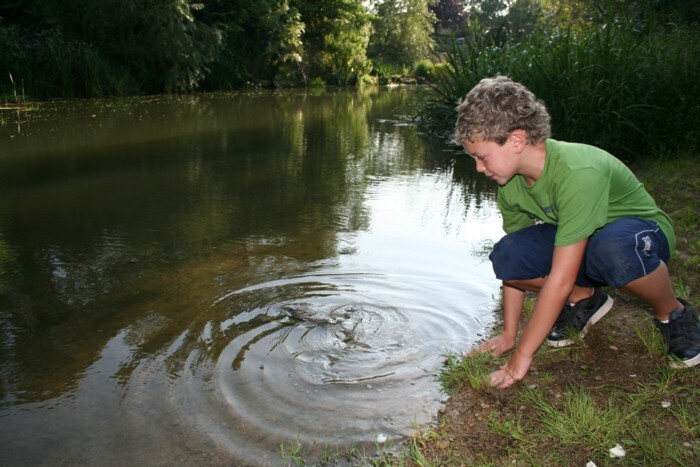 So after a few photo’s we safely returned the chub to the river and watched it swim away. The other 2 anglers were just about to pack up and we were going to move on to the swim where the barbel are. So in about an hour we had caught 2 chub from a clear difficult river. The reason for moving was that the chub were spooked now and catching another would take some doing. Perhaps we could try again later after going after the barbel. The temperatures now had started to reduce as we made our way to the barbel swim. I could just about make out a large barbel in the cabbages but Tyler couldn’t quite see it. After I tossed in a few pellets the barbel came up to feed on them. 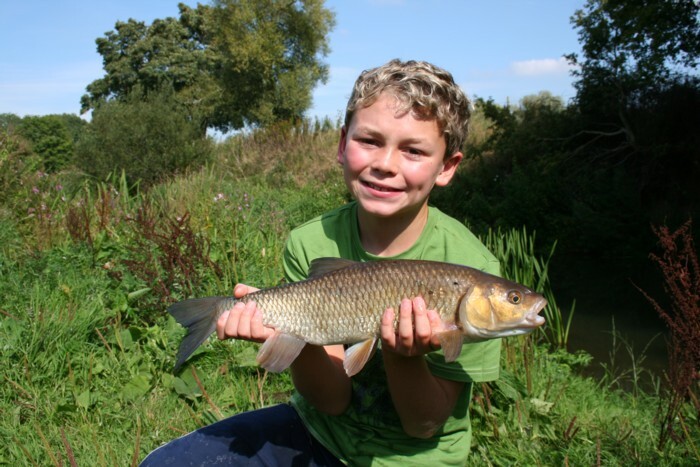 Tyler soon saw the large barbel and couldn’t believe it’s size. I couldn’t see how many barbel were present as the water was soon clouded up with all of the rooting around. I quickly tackled up and soon had a PVA bag with pellets and one hair rigged on the hook. I only had to wait a few minutes before the rod pulled around and I was playing a small barbel of about 3.5lbs. Tyler helped me land the fish. He was just a bit excited. 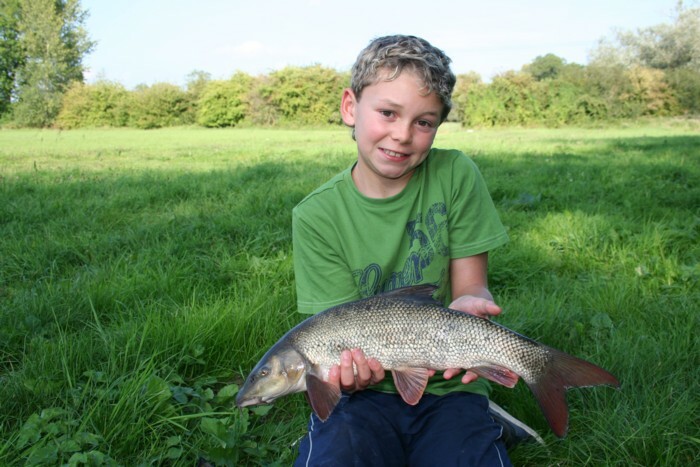 The barbel was about 3.5lbs and is probably the smallest one in the shoal. We did stay for 10 minutes or so to see whether any of the others came back, which of course they didn’t. Time was now getting on and we had 30 minutes left. I asked Tyler whether he wanted to return to the original swim to catch another chub on crust. I knew the answer! So the sun now shone directly on the swim where the chub were and we could see a few swimming around. Tyler was eager to use the catapult again. So he fired out more pieces of crust with his now normally good accuracy. We could see the chub come up to inspect the crust but were very spooky. They would only take the occasional one. Further down the swim’s run we could see one chub was taking the bait. So the plan was actioned once more and probably for the last time as it was close to packing up time. Soon the float was travelling down in the flow. There was a very slight slurp in the water and the crust was gone followed by the float. Fish on again for Tyler to land. So another nice 3lb chub for him. It was 5.30pm now and time to go. So we decided to get a couple of shots of Tyler returning the chub. So that was it for the afternoon 3 chub two of which were 3lbers and a small barbel. 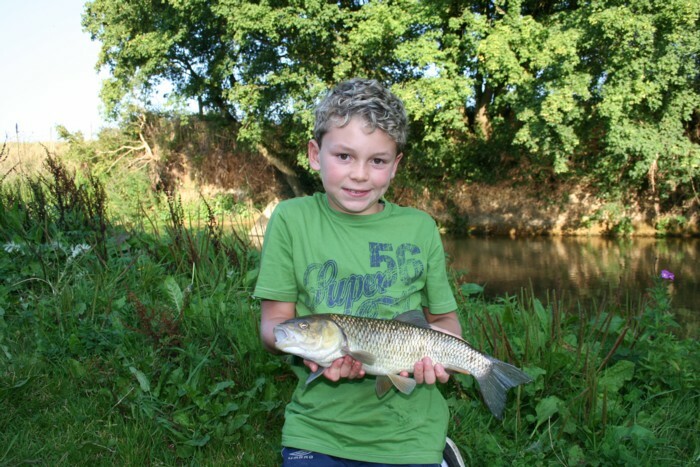 So what I thought would be very difficult fishing turned out to be OK.
I’m sure Tyler enjoyed his session. This entry was posted on Saturday, September 3rd, 2011 at 10:31 am	and is filed under Uncategorized. You can follow any responses to this entry through the RSS 2.0 feed. Both comments and pings are currently closed.